Cute Fall/Winter Shoes and Boots – All Under $30! With cooler weather comes the need to switch out your wardrobe…but don’t forget your shoes! Adding a new pair of shoes or boots to your closet is a great way to switch up your look and keep your tootsies covered. Savings.com has rounded up some super CUTE shoes and boots, all priced under $30, from all over the web – 6pm, Charlotte Russe, and more! This entry was posted in Shoes on October 26, 2017 by Laura W.
What looks good but is still functional for the winter.? Wedge booties! 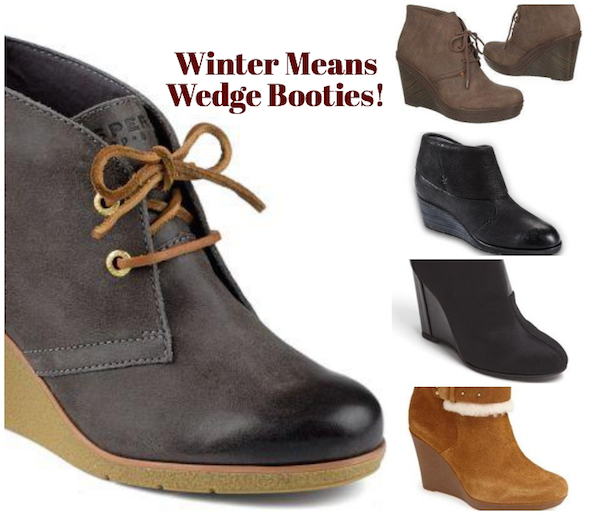 Compliment your favorite winter fashions with the perfect wedge bootie and heat things up a bit. I love the booties with laces for a casual look! Here are some great choices – both with and WITHOUT laces! This entry was posted in Fashion, Shoes on January 15, 2015 by Chrysa. 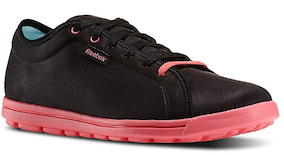 Reebok SkyScape Runaround Shoe – You Can Customize Them! While we all love a closet full of shoes, it’s still nice to have shoes that do double (or triple) duty so you can go through our busy days without adding to the “to do” list by having to change shoes too! With so many activities in your life, who has time to coordinate a multitude of shoes to go with them all? Check out the Reebok SkyScape Runaround Shoe. This shoe is so super comfortable you can wear it to the gym, workout, then onto a full day of errands and running about town. And it doesn’t look like the standard workout shoe — it is simple and stylish and looks great with everything from yoga pants to jeans. You can even customize it to work with your wardrobe! 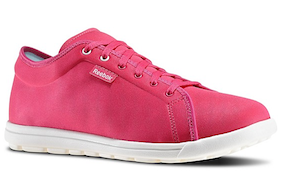 If you’ve noticed Miranda Kerr wearing a pair of hot new pink shoes in the press, then the Reebok SkyScape has already caught your eye. (If you haven’t seen hers, take a look at her SkyScape commercial that everyone is buzzing about.) The Reebok SkyScape Runaround Shoe is now on sale. Go design yours today! This entry was posted in Shoes on April 2, 2014 by Chrysa. TOMS Spring 2014 Collection! 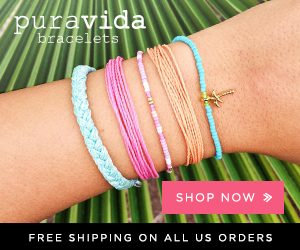 New 15% Off Coupon Code Plus FREE Shipping ! Even though many of us are still suffering through the tail end of a horrible winter, it doesn’t mean we can’t spring forward a bit and buy some new shoes for the upcoming seasons. TOMS is even helping us out by offering 15% off any TOMS branded purchase when you use TOMS coupon code MARCH15 at checkout! This offer is valid 3/2-3/8 only. Browse through all the new styles including the new Jutti flat, the new Platform Wedge, Playa and Correa sandals and MORE! Let us know what fun styles you find! This entry was posted in Deals, Shoes on March 4, 2014 by Chrysa. Did you happen to see the dress Sarah Jessica Parker wore on the opening night of The Tonight Show with Jimmy Fallon? She was only on camera for about 10 seconds, but that dress was just GORGEOUS! I have had SJP on the brain since that night, so was excited to see the new collection by Sarah Jessica Parker exclusively at Nordstrom. The collection is dominated by shoes, but she also offers handbags and apparel. While you’re browsing, also check out their Pin to Win giveaway for a chance to win a $2,000 shoe wardrobe! Pin your favorite shoes or repin your favorite images from the SJP: A Day in Her Shoes board to any board in your Pinterest profile. 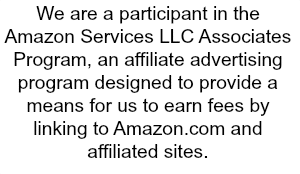 See the details and enter here. This entry was posted in Shoes on February 28, 2014 by Chrysa. 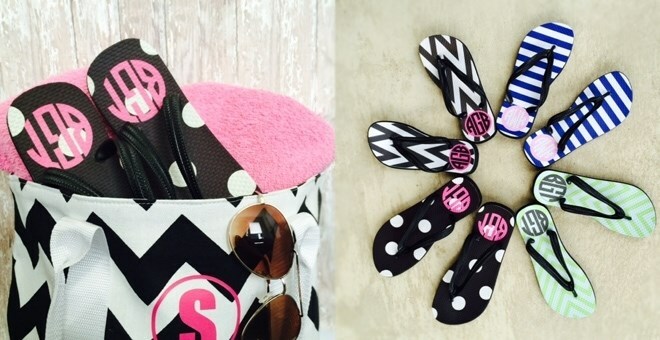 Unique Monogram Flip Flops – – They’re Only $19.99!! I absolutely love these flip flops!! Grab a pair of these cute, monogrammed flip flops and you’ll be all set for the warmer weather that is sure to come sooner or later! These are GREAT quality flip flops made specially for this “sublimation” printing process. Pattern and monogram are printed on the actual shoe surface itself! The shoe has a sturdy ½ inch sole with black straps and sides. They make fabulous bridal party and birthday gifts! These monogram flip flops are usually $34.99, but right now through Jane.com they have a special delay making them only $19.99! Shipping is $4.99 for the first item and $2.99 for each additional item. Available in the four patterns shown above. This entry was posted in Shoes on February 26, 2014 by Chrysa. Nordstrom Spring Shoe Clearance – Prices Up to 60% Off! It’s time for the big Nordstrom Spring Shoe Clearance! They have hundreds of styles on sale as much as 60% off. The nice thing is that it isn’t just boots and “winter” shoes on sale, they even have some sandals and other styles to get you ready for spring! And don’t forget, Nordstrom offers free shipping and free returns on any order all the time! This entry was posted in Deals, Shoes on February 13, 2014 by Chrysa. And now for something totally awesome. … When it comes to music and NYC style, few have more style and class than Alicia Keys. Reebok partnered with this amazing woman to create an all-new, sleek wedge. 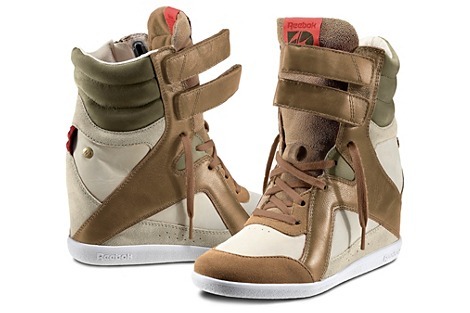 Step up your fashion game with the Alicia Keys Mid Cut Wedge for a smart, stylish look. The wedge comes in four colorways that are all perfect for a casual fall day, or a night out on the town. Check out the Alicia Keys collection now here: Alicia Keys Mid Cut Wedge. This entry was posted in Fashion, Shoes on November 3, 2013 by Chrysa.